Once the MLB season has completed, we begin work on updating pitcher's DVS Scores and building a profile of each MLB organization. As I sat down to begin the annual process, I started to notice similar injury patterns with respect to age, DVS Score, and the event of a major throwing-related injury. To clarify, we refer to an event as having missed a significant amount of time due to a throwing-related injury. Many pitchers will make a trip to the 7 or 15 day DL but are still able to be available for the majority of games throughout the regular season. Our focus has been and will continue to be on finding correlations between a pitcher's DVS Score (mechanics), injury risk, and rate of injury. We have provided the following summary as a means to interpret the trends in mechanics and injuries throughout professional baseball. Over 100 pitchers comprised our data set; roughly 17% of all MLB 40-man rosters. The summary below is just a snapshot of major league baseball, but with the large data set, we can gain a relative pulse of patterns/trends that have emerged and continue to develop. Our initial formal study of current professional pitchers resulted in an average DVS Score of 12.8; similar in comparison to the 12.61 average seen in the table above. This average number has remained consistent throughout our scoring of professional pitchers since 2014. One of the areas that peaked my interest was the striking similarity in the percentage of pitchers who have undergone a major throwing injury across five organizations. With an average age of almost 27 years old, our data indicates approximately 1 out of every 2 (46%) pitchers have undergone a major throwing injury. But as you will see below, the DVS Score range of the 46%, showcase a more transparent picture. 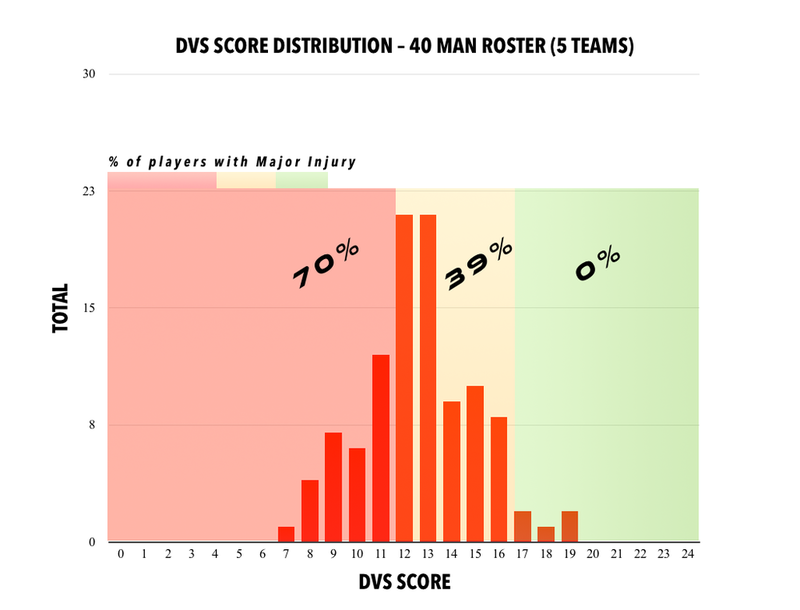 The table below illustrates the relative DVS Score ranges compared to the event of a major injury. The three DVS Score ranges are 0 to 12, 13 to 15, and 16 to 19. Why the specific ranges you may ask? Over the course of our research, we have found pitchers within the respective DVS Score ranges exhibit common injury patterns. We will continue to group the respective ranges as long as we continue to find corresponding injury patterns. Notice any patterns? The red bars are gradually decreasing in value whereas the green bars are steadily increasing in value. This relationship signifies the predictive associations DVS Scores can communicate to MLB Organizations. For example, if you have an extensive distribution of pitchers below 12 on your 40-man roster, 57% of those pitchers have proven they will undergo a throwing-related injury at a faster rate to pitchers who have a DVS Score of 13 to 15. In stark contrast, look how different the injury relationships are within the 16 to 19 sample group. Almost 70% HAVE NOT had a major throwing-related injury! The graph above provides a clear distinction between low DVS Scores vs. high DVS Scores and their relative impact on the health of a pitcher; especially as a pitcher vaults into the 16 to 19 range. Perhaps our strongest correlation was found when we grouped all five organizations pitchers together in a distribution graph. A predominant statistic surfaces which shed lights on the current culture of baseball and where baseball needs to go if it wants to eliminate throwing injuries. 0% of pitchers with a DVS Score of 17 or higher have undergone a major throwing-related injury whereas 70% of pitchers with a DVS Score of 11 or below have undergone a throwing related injury. High DVS Scores still exist, just a minuscule number of them. In fact, in over 100 pitchers scored, only 5 received a DVS Score of 17 or higher. Just 4%! What does this mean? It means very few pitchers currently exhibit a mechanical pattern that statistically yields itself to less injury. As we have mentioned above, the vast majority of the professional pitchers have a DVS Score of 12.5, and as the graph above continues to portray, a large density of pitchers yield a DVS Score of 12 or 13. How different would the game of baseball be right now if the average DVS Score of a pitcher was 16? We can estimate there would be far less injuries, and all the performance analytics would have much more value. As I continue to score pitchers of all ages and ability levels, I'm confident of two things; High DVS Scores do exist and injury rates among pitchers will continue to rise in the next several years. It's impossible to account for all the external factors that influence the rate of injury to a pitcher, especially with the increased volume of throws and attention to velocity generated by the culture surrounding our youth population. However, we can use the birth year of a pitcher because it provides a general framework of what they have been exposed to as they have developed from youth to a professional pitcher. Therefore, we can project the next wave of pitchers arriving into professional baseball will demonstrate a normative range of injury patterns as seen above.